Portable Model "Great volume without distortion"
"Plays 10-inch records with lid closed"
CASE:-- Black, high grade waterproof covering, with nickel corner pieces for protection of case. Two strong locks with keys and safety locking device. All metal parts highly nickel-plated. 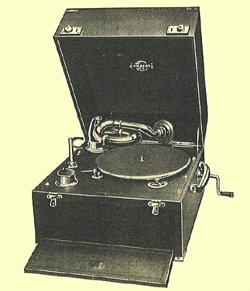 MOTOR:-- The famous Garrard, with 10 inch Turntable. AMPLIFIER:-- All metal, specially designed for great volume. 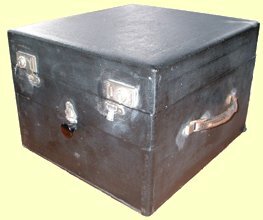 Below are some recent pictures of the Gilbert Portable Model from my collection.